Want to say something? At inSite, we help you say it! Whether to clients, employees, colleagues or an industry; whether online, with posters, slides, videos, apps, SMS, email or anything you can imagine... whether you know how to say it or not: we are there to solve all your communication challenges and have fun whilst we are at it. 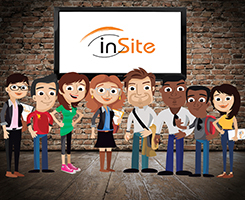 inSite Education is your all-in-one consultant for multi-platform communication and marketing campaigns. At inSite Education, we write, design, print, email, SMS and develop anything that you need to get your message across. You name it, we do it. Our goal is to help you really reach people with your campaigns. So that they actually listen and understand. No matter what the subject or medium, we can create a marketing or communication campaign that works for you and your audience. Concerned your message is too complicated? Not to worry! At inSite we specialise in helping you break down complicated content into easily understandable messages. And we make it interesting and entertaining too. We have assisted hundreds of businesses with Financial, Pension Fund, Medical Aid, Business processes and corporate communication and education. At inSite, we live and breathe innovation. Let us find creative methods to help you reach your target market. We would love to chat with you and share ideas over a cup of coffee (on us). Contact inSite today for a free quotation and let's see how we can get your message across. We are a team of dedicated, creative individuals who live and breathe innovation. You definitely want to get to know us! Try our online meeting software. Compatible with all devices across all platforms: PC, Mac, Tablet, iPad, Smartphones. Money Back Guarantee. inSite is keeping up with the times by expanding our presence on social media! And we want our most important clients to get involved. Did you know that R69-billion has been set aside for Eskom’s restructuring?